Wow! Month 4! The month was characterized by slower travels and more connections! We are also so pleased to announce that we have become first-time uncle and aunt this month. Congrats to Eric’s sister Suzanne on the birth of her beautiful baby girl, Sofia. Here are our stats for this month. We traveled by 0 planes this month! We traveled by 0 trains this month! We traveled by 20 long distance buses. ~ Our first top moment came at the very beginning of the month! 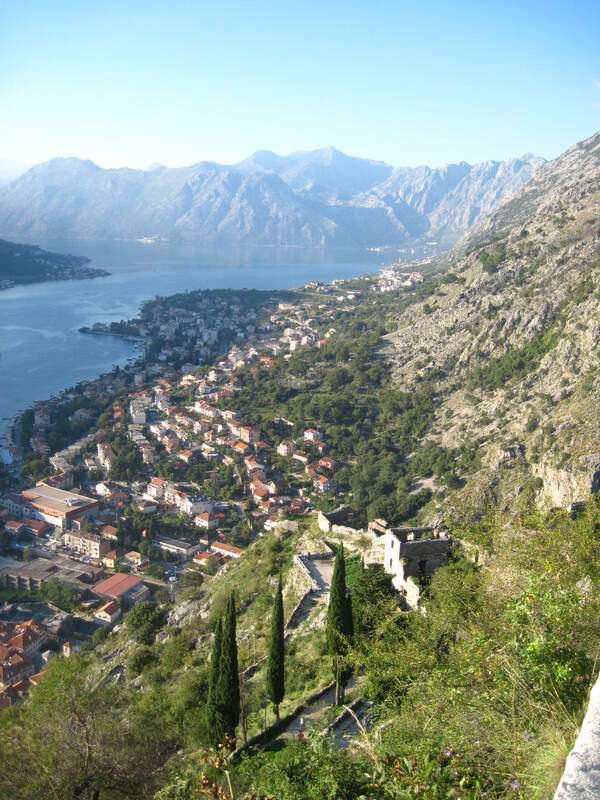 We had been looking forward to our visit to Kotor for a long time. We really enjoyed slowing down in Kotor at the end of last month and the beginning of this month. One of the best days we had there was when we climbed the fortress walls. It was an absolutely gorgeous day weather-wise. We waited until the late afternoon to miss the cruise ship crowds. We climbed up the mountain, enjoying amazing views, and even a sunset on the way down. It was lovely! 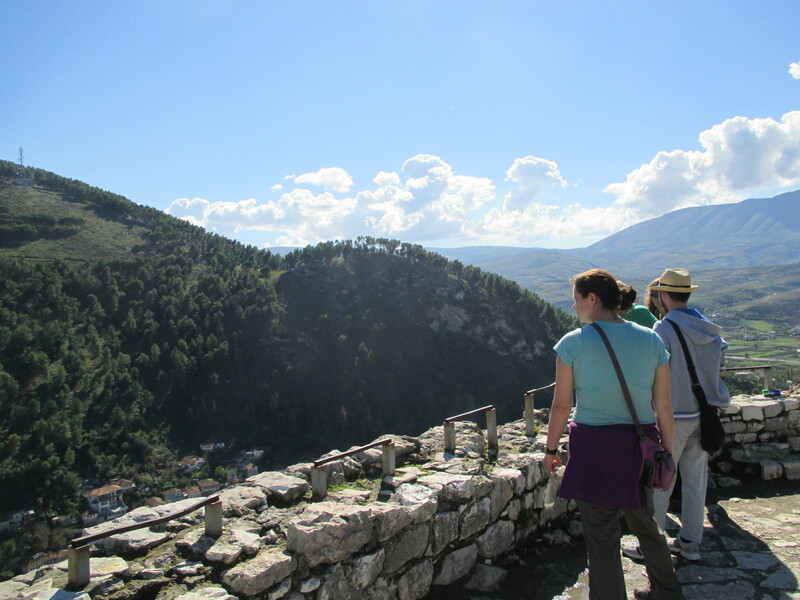 ~ Our second moment came in Berat, Albania. 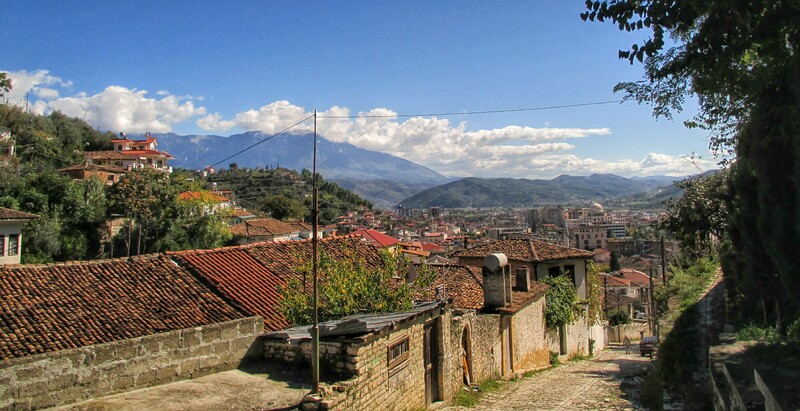 We knew almost nothing about Albania when we arrived (though learned a lot while we were there) so we didn’t know what to expect. We had heard that it was not really on the tourist track in Europe. We were so impressed with Berat! Our top moment came when we decided to take a tour of the city offered by the worker at our hostel. 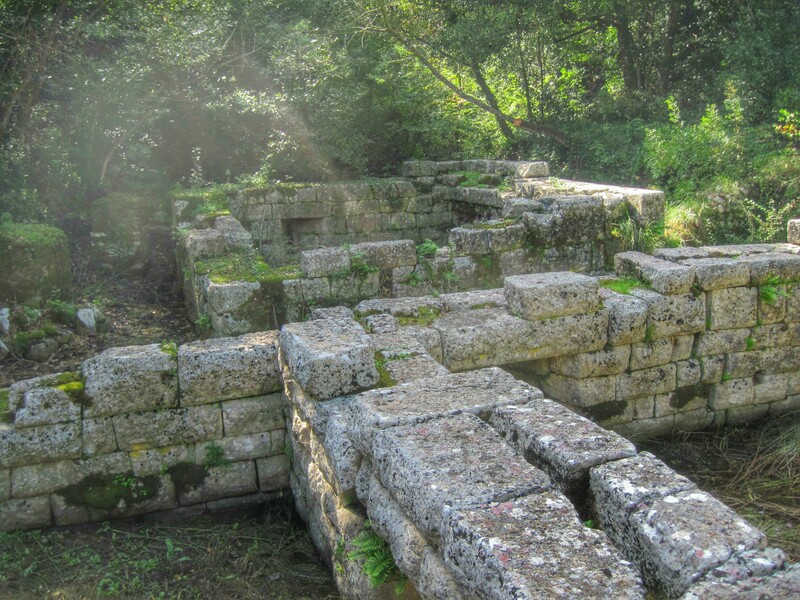 He was a native of Berat, and knew a ton about his city and the history of Albania. The tour was particularly personalized because there were only 4 of us. The other couple was an amazing pair of bikers from Belgium. The tour started at 10 am and after seeing the beautiful city of Berat, we sat down for Turkish coffee (tea for us) and then dinner with both our guide and the Belgian couple. It was a fantastic way to spend the day, full of everything we love about traveling – new friends from around the world and learning a lot about cultures we didn’t know much about! ~ We mentioned above that this was a month where we made some really great connections. The first was our Belgian friends in Berat, the next was a couple of Americans from Washington state (and Idaho). There is almost nothing better than seeing another pair of travelers trying to make the same long travel day as you are. It helps with confidence, knowing that someone else is attempting the same trip, as well as company! It is even better when you find out that you have a lot in common and really enjoy chatting with each other. 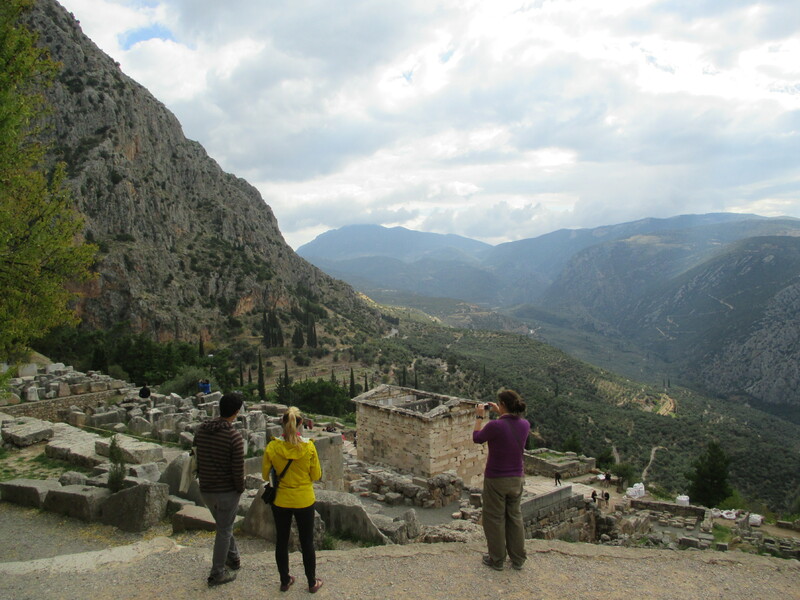 Our top moment was when we were able to visit the ancient site of Delphi with our new friends. Wow, we have to say, it is a wonderful experience to find another couple who enjoy reading Rick Steves (and other informational signs) as much as we do, and who enjoy talking popular culture, TV, and books (even the Wheel of Time series!!!) in the breaks. What luck! We had a great time! 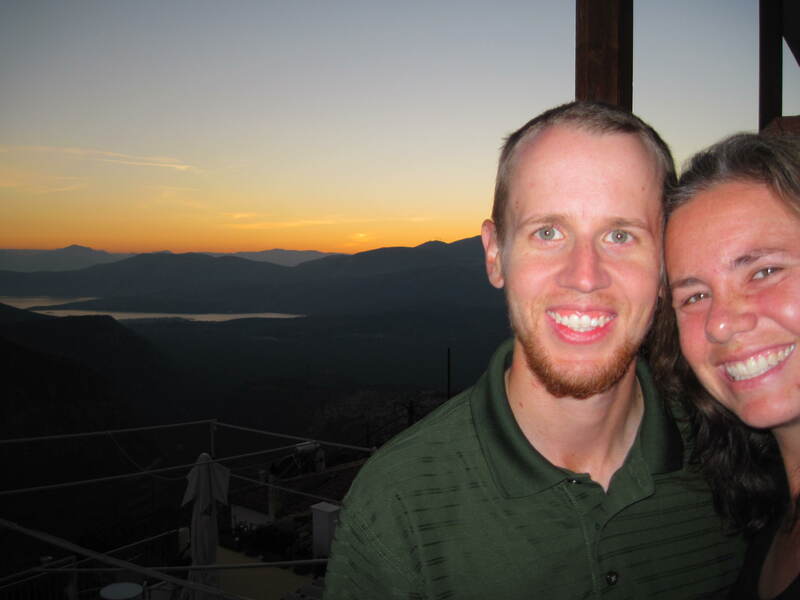 ~ We already mentioned in this recap that we really enjoyed our time in Albania. Another example of this was our time at the archaeological site of Butrint. This was a wonderful place with a lot of history, but the best part was that we got to experience it practically on our own! We didn’t see any other tourists almost the whole day! What was even funnier was that when we got back to our hostel in Saranda, we found out that 4 other people from there had done it as well, separately, but it was big and empty enough that we didn’t even see each other. This is not to say we don’t enjoy company, but there is something special about experiencing an ancient city (and tourist attraction) without having to dodge the crowds. 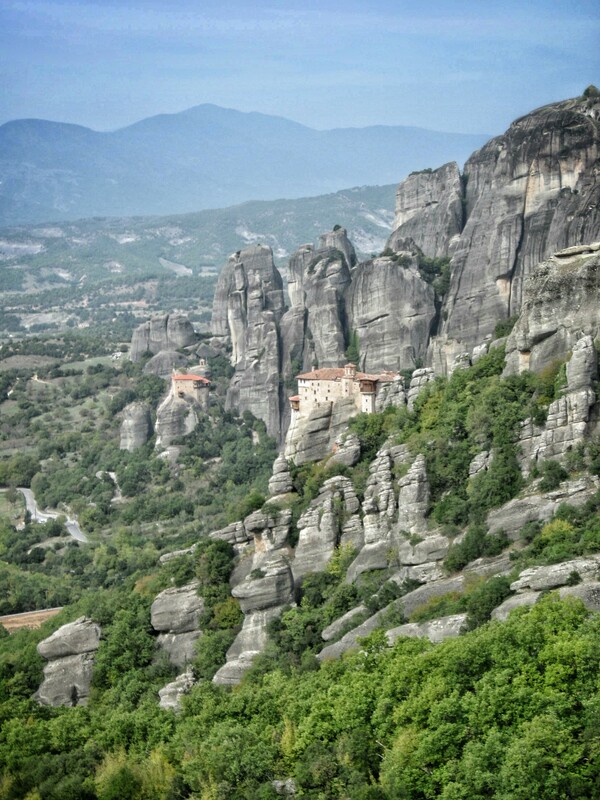 ~ Our second runner up was in Meteora, Greece. 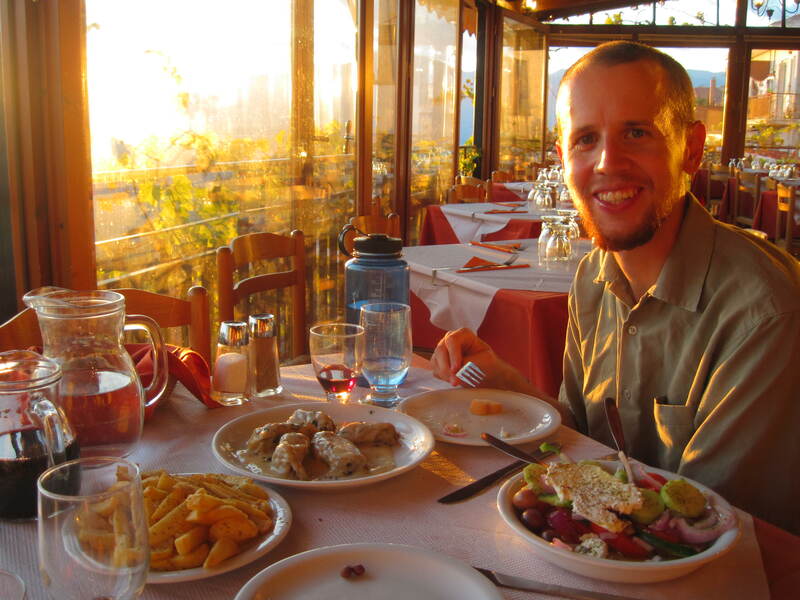 We were pretty excited to finally reach Greece, which we had been looking forward to for a very long time. 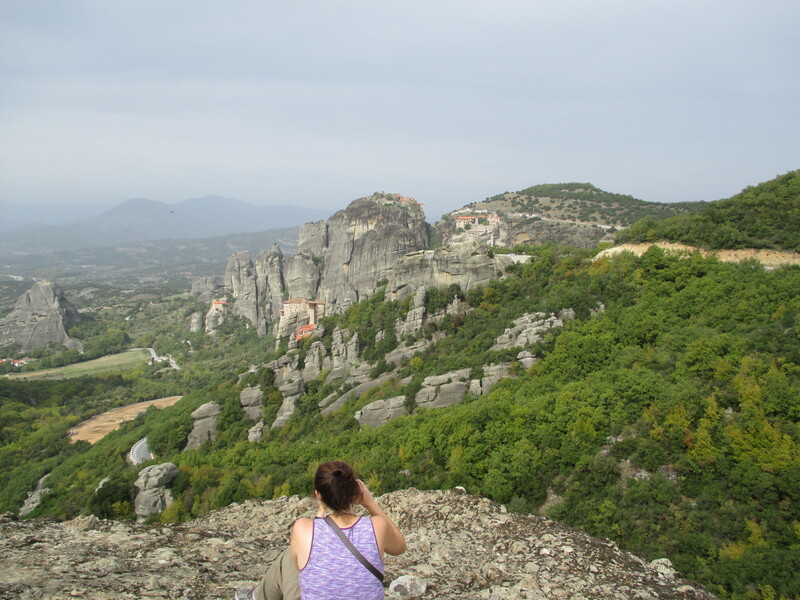 Della has dreamed of visiting Greece for as long as she can remember. Meteora did not disappoint. We walked among the monasteries taking in the unique, impressive scenery and imaging what it must be like to make your home on the top of vertical pillar, high above the world. It was especially good when we were able to escape from the tourist bus crowds. 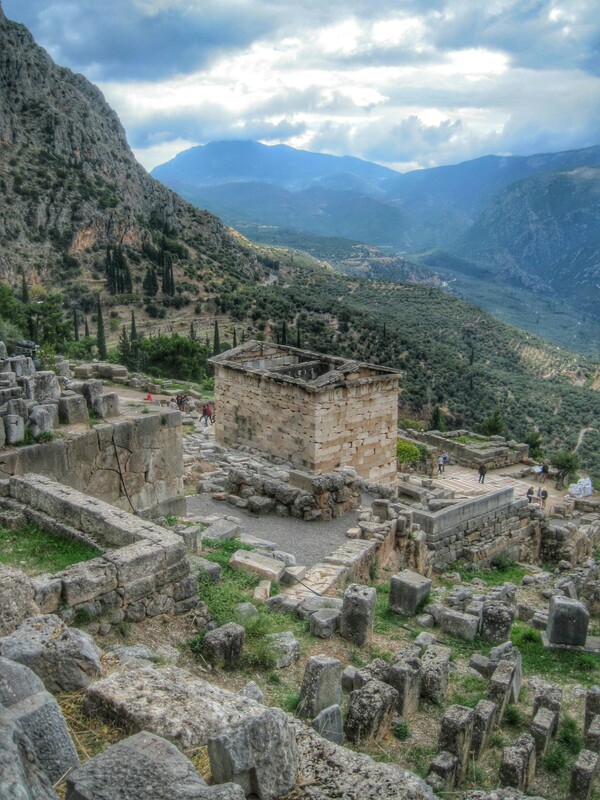 ~ We had a wonderful time with our new friends in Delphi, Greece. 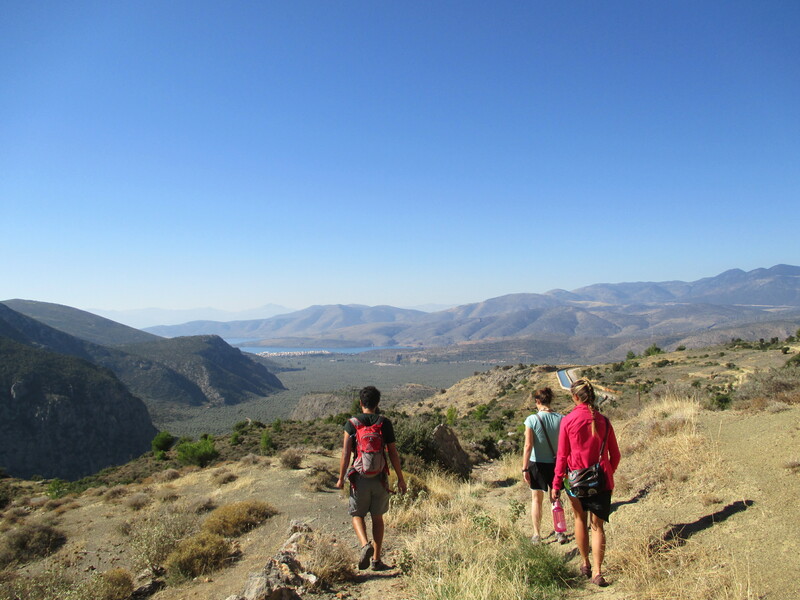 One of the activities that we did with them was to take a walk from Delphi, down the mountain, through the olive groves, and to the coast. It is actually the reverse of what many pilgrims did in ancient times on their way up to hear their fortune from the Oracle. We had a magnificent day, with perfect weather. The scenery was shockingly beautiful and our company was grand. It was hard to beat! ~ As some of you may already know, we celebrated 10 years of being together as a couple this last month. We couldn’t have picked a better locale. 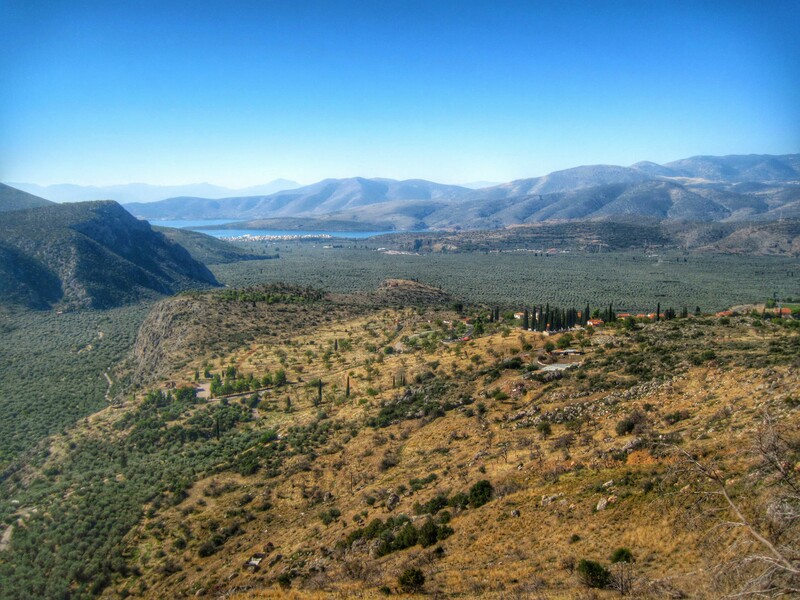 Delphi, Greece was absolutely beautiful. It is hard to imagine a better way to remember 10 great years with a person you love while overlooking one of the most fantastic sunsets you’ve ever seen! We got to use our summer gear a bit this month which made us happy! We also have used our winter and rain gear, so we are glad we have it all. Della hasn’t used her dress since Budapest so is wondering if it is necessary. Eric is happy with all of his contents. Della has read Fire From Heaven by Mary Renault and Gone Girl by Gillian Flynn. Eric has read The Persian Boy by Mary Renault, The Golden One by Elizabeth Peters, Black Ice by Lorene Cary, Making Money by Terry Pratchett, Crescent Dawn by Clive Cussler. Eric and Della have BOTH read The Greek Treasure by Irving Stone and Hope of Earth by Piers Anthony. Sorry we were not there this month. Piers Anthony, really? In general I wish you would include a star rating on what you’ve read, so I know whether to add it to my reading list.